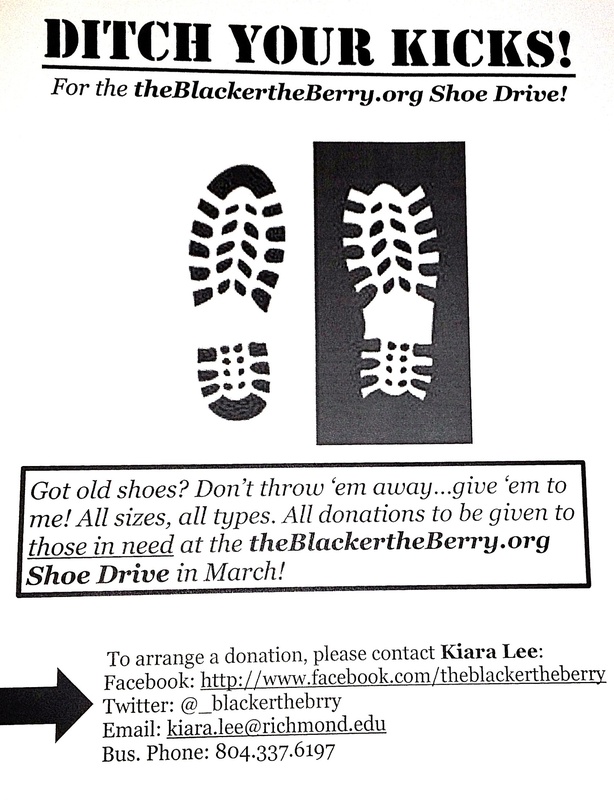 Collecting shoes for the “TheBlackertheBerry.org Shoe Drive,” happening in March, to share our soles with those in need in RVA! Ditch your kicks for the needy! If you have any shoes that you can’t fit or simply don’t want, give them to me! I’m accepting all styles, all sizes. In March, I’m having a shoe drive for those in need in Richmond. My trunk is already FULL of shoes, but I know through the kindness of your hearts, it can get even fuller! What better way to give this holiday season. To arrange a donation, please contact me, Kiara Lee. Check out the flyer for more info!